KYIV - Ukrainian President Petro Poroshenko said that based on the information he possesses, the Committee of Permanent Representatives in the European Union (COREPER) considered restrictions over actions undermining Ukraine's territorial integrity, namely for organizing and holding the Russian presidential election in Crimea, and supported this initiative at a meeting on May 8. "We have just received a report that as a result of our intensive cooperation with our partners in the European Union, including Slovenia, the Committee of Permanent Representatives in the European Union adopted a decision on May 8 in line with the Council of the EU's regulations on restrictive measures over actions undermining Ukraine's territorial integrity, sovereignty, and independence," Poroshenko said at a joint press briefing with Slovenian President Borut Pahor in Kyiv on Friday. These legal acts impose individual sanctions on persons who were immediately involved in organizing and holding the Russian election in Crimea, he said. 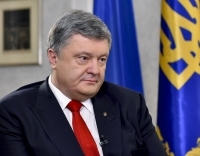 Poroshenko thanked Ukraine's international partners for their position. He also said he had discussed Crimea at a bilateral meeting with his Slovenian counterpart and thanked Slovenia for its position regarding Ukraine's sovereignty and territorial integrity.